And let the holiday decorating begin!! If you are not a holiday decorator until after Thanksgiving, you and the rest of my family feel about the same way. I received nothing but groans as I happily chucked the pumpkins into the dumpster, and told hubby to start dragging the trees out of the attic. I know my family would much rather wait until later to get into the holiday spirit. I am a Christmas lover, but I know the rest of the world feels differently. 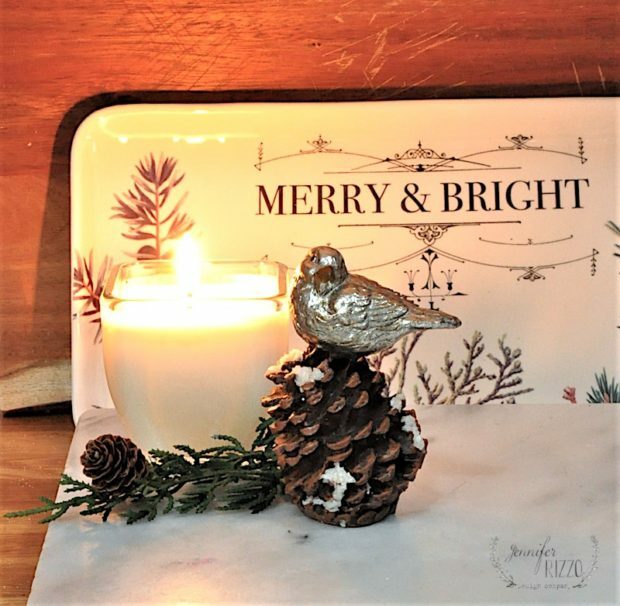 As I stared decking my Christmas kitchen, I realized we have the double curse of being in retail, and blogging, so I always have to be a season ahead. Really though, my family is lucky I don’t insist on hanging the stockings right after the Fourth of July. Though, I will say, some publications want to shoot your holiday home when it’s convenient for them, and normally, that’s right around May or June. I am excited to be a part if the Seasons of Home series again. I love being able to peek inside of how other people are decorating their spaces for the holidays. With that in mind,we are also gearing up again for the Holiday Housewalk 2017! 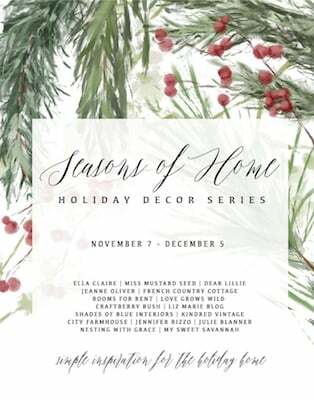 Make sure you stop by to see over 30 bloggers share their homes, fully decorated for the season! You can see last years house walk here. This year for my kitchen, I added some fun touches with things we carry in the shop! I used a a fun blue pom pom scarf as a table runner. I loved that it had some red in it, and I could play off the red in my dutch ovens. They are permanent fixtures on my stove, I use them all of the time.I love how our new subway tile looks in the background! I made some delicious sipping chocolate we carry by a local chocolatier, and added plenty of whipped cream in some mugs I found at Homegoods a few years ago. I actually have to hide this from my kids because they will eat it straight out of the bag with a spoon, it’s like 80 percent hand-grated semi-sweet chocolate. I swear wolves did not raise them, even though it seems otherwise. I guess I should consider myself lucky with that they at least use a spoon. 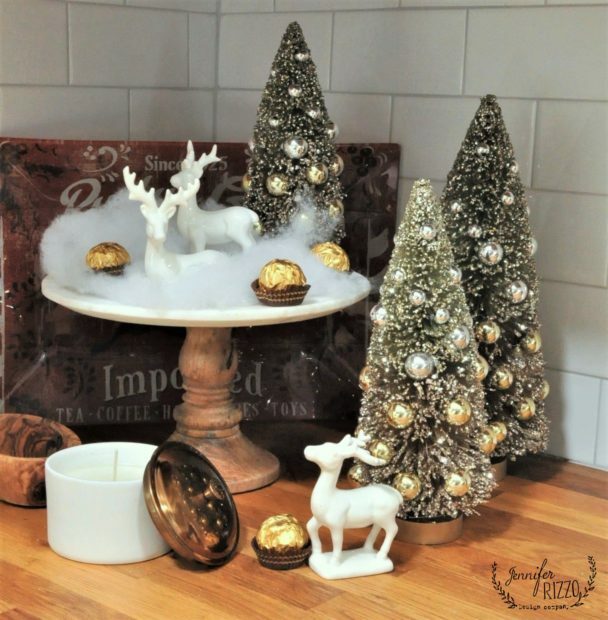 I added some sparkly touches like the glitter bottle brush trees, and these cute, little ceramic deer we have scattered all over the shop, and a yummy vanilla-scented candle. 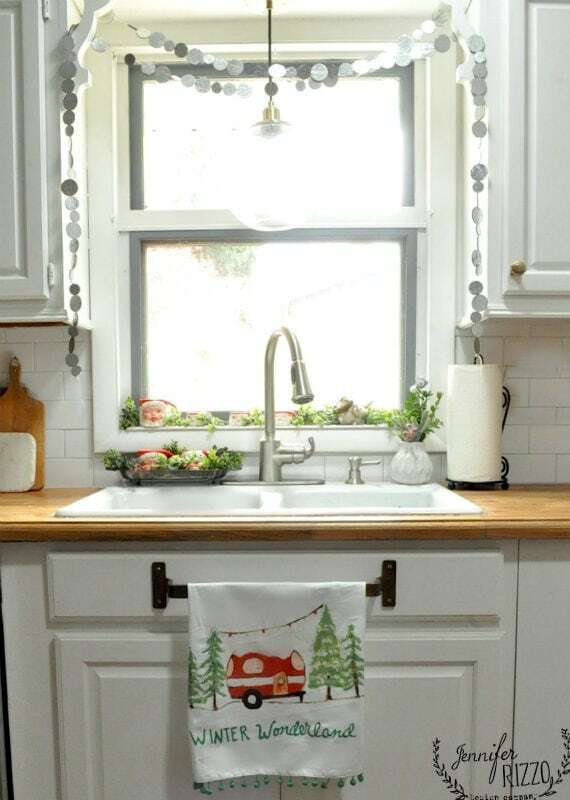 My window is always my favorite spot, and I added a cute hand towel, and some silver garland over the sink area. 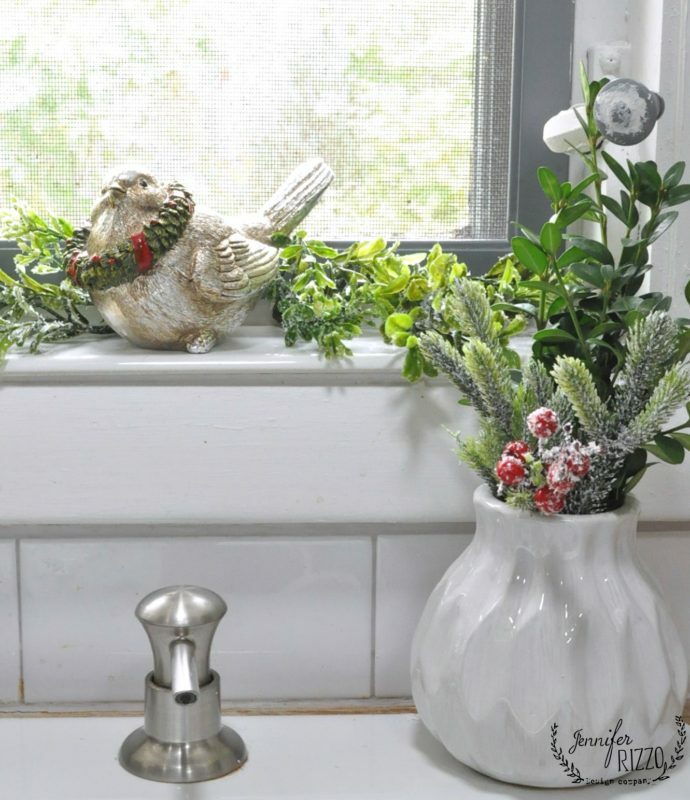 I added some faux greenery to add some cheer to the window sill, since I spend so much time there. I love being able to display my vintage Santa mugs in my Christmas kitchen, though I can never decide if these mugs are cute, or just a little but scary. Who doesn’t love a bird! These little birds on pine cones are so adorable! We also have these beautiful plates that say Merry and Bright, and I made sure I grabbed one for myself. They are going to be perfect to serve some cookies on! I kept my open shelves somewhat simple, and just added a few touches beyond what I normally have. I added some fresh seeded eucalyptus which is my favorite, and brought out all of my gold rimmed glasses, and copper for a touch of sparkle. The nice thing about being short is the top shelf will only ever be display. 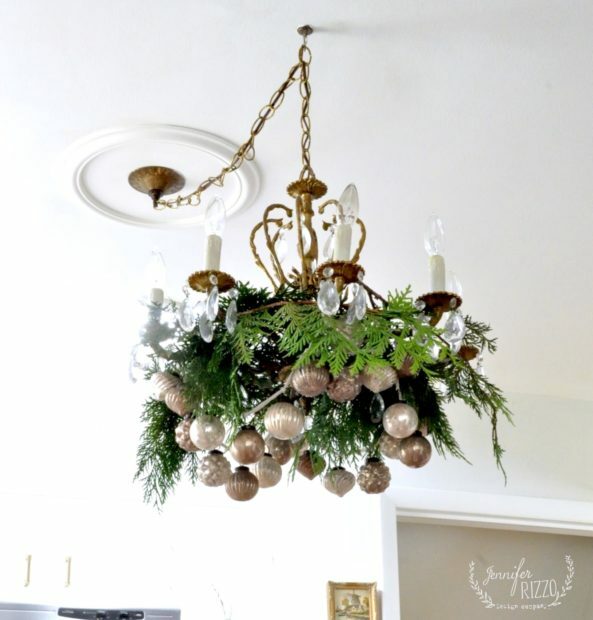 It might be boring to do the same thing over and over, but every year, I always add mercury glass and greenery to my gram’s chandelier. This year my Alaskan Cedar was big enough to take some really nice cuttings from which was really exciting (For me. I know, I’m a garden geek.). A few years ago,I decided to start planting my yard as an all season cutting garden, which means there is something I can bring inside all year round. I love going out and gathering all kinds of things to decorate inside my home, even when it’s too cold to go outside! Thank you so much for joining me on this Christmas kitchen tour! 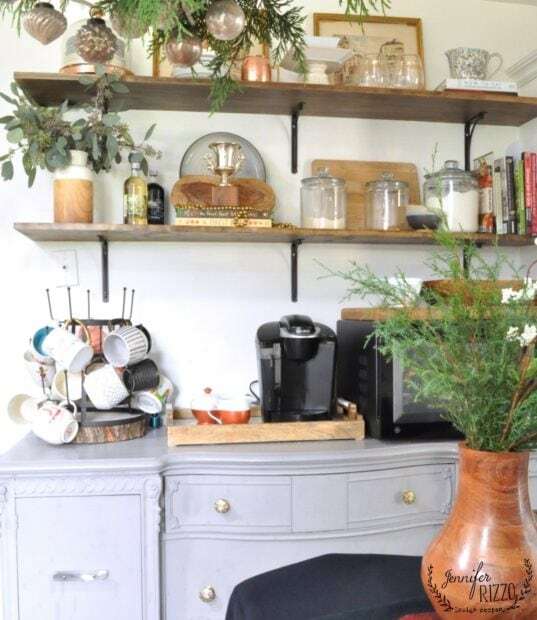 Make sure to visit all of the other talented bloggers on the tour to see their beautiful homes! hopefully your family stopped complaining as they were sipping your hot cocoa! Love that plaid runner on your island. Feels so festive and fun! Your touches of Christmas are absolutely beautiful, Jen! And your chandy is outstanding!! So pretty Jen! Your plaid pom pom scarf used as a runner is so cute!! I’m doing a little version of plaid this year. I loved the plaid on your island. What date is your holiday housewalk this year? It is my fave tour to see each year. I can’t wait to see what everyone is doing. What a warm and inviting kitchen! Love all your touches of fresh greens. It’s beautiful, thanks for sharing with us! I think you do so much, so well. I love seeing how you have decorated your home. That sipping chocolate sounds wonderful. Any chance you do mail Orders? 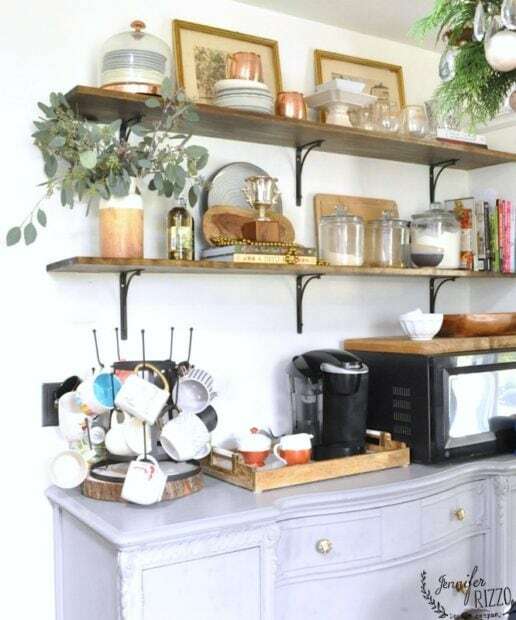 My favorite is the coffee station with the open shelving and I LOVE how you dressed up your chandelier! I love your vintage Santa mugs on the kitchen window sill. I have a set of the four small ones that were my mom’s. I put them out every Christmas in my kitchen! Thank you Judy! I love mine too. They are hard to find! Everything looks so festive! 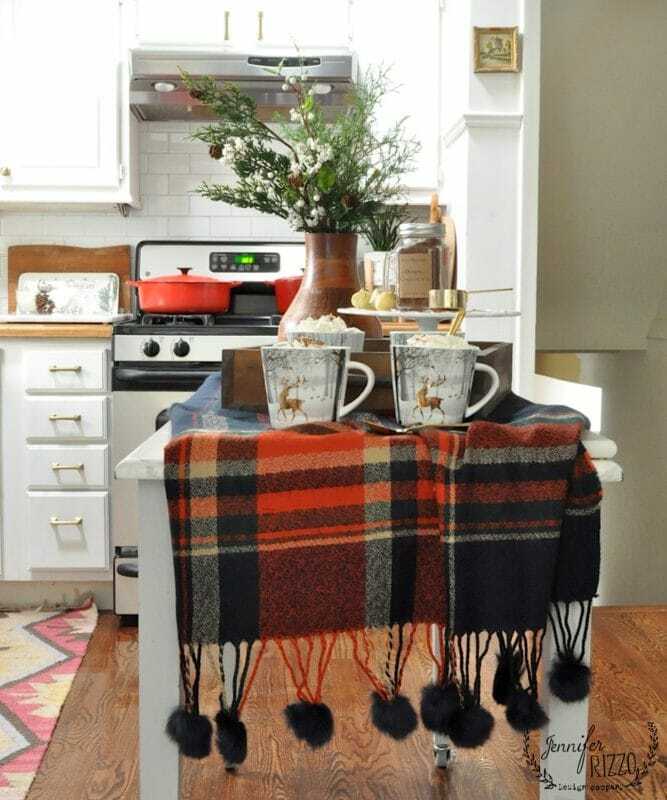 I love the plaid wool table runner. I’ve gotten a lot of inspiration looking at the kitchens on this tour. I’d start now but I’m hosting Thanksgiving here. One thing for sure, I’m going to start cleaning my counters so I’m ready to try out some of these cute ideas! Thanks Jane! I hope you have a wonderful Thanksgiving! Jennifer, CHEERS! 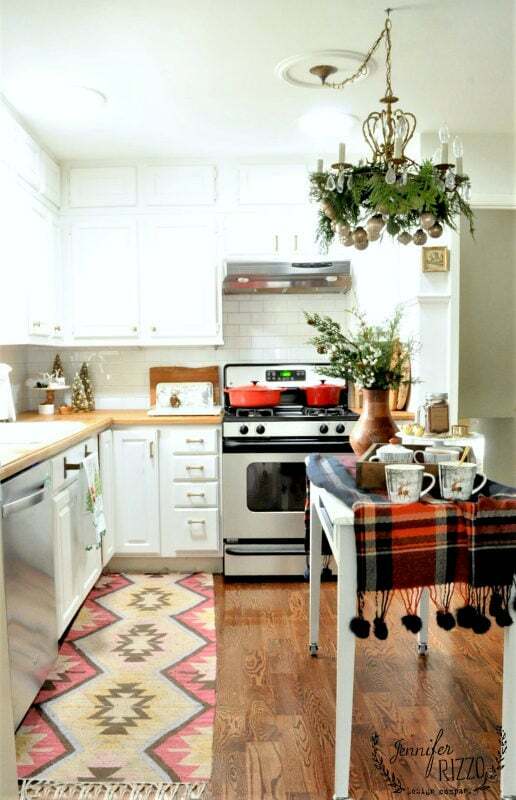 As always, your Christmas kitchen has a lovely festive flair! Your chandelier makes me want to sing, “We Need a Little Christmas”!! Perfection! 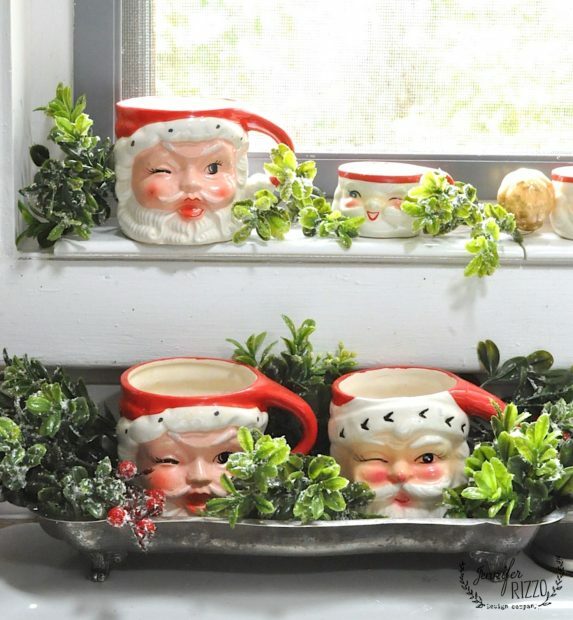 I laughed out loud when I read about you not being sure if your vintage Santa mugs were cute or scary. When my husband and I were first married, my mother-in-law gifted me with ‘her collection of 6 vintage Santa mugs, nearly identical to yours. I loved putting them out each Christmas and still do. The Christmas our little girl was three, she was old enough to enjoy and appreciate decorating the house for Christmas. I was in the kitchen making a vignette with my Santa mugs on an old silver tray when she walked in and came around the table to see what I was doing. I picked up one of the mugs and showed it to her and telling her how cute it was. The color drained from her face, she let out a blood-curdling scream and ran from the room. I followed the screaming and found her in our master bath. A look of terror was on her face and she cried, “Bad Santa, Bad Santa!” I finally had to pack the ‘bad Santas’ into their box, tape it up and show her I was putting that box of horrors next to the garbage cans in the garage so the garbage man could take them away! That box of horrors was not opened and displayed unil our youngest child was 12 years old! She is now 35 years old and loves those Bad Santa mugs. Thank you for sharing that story Judith! It’s so funny how something people thought were so cute are a little creepy! I still love them! Hi! I was wondering where your carpet runner was from. I love it! Thanks! Hi Jen,thank you! It’s from Target! Hi! I love the cute towel hanging on the sink.